At the UB Foundation, we are proud of our role in managing endowed chairs that attract world-renowned researchers and scholars to UB—including James D. Bangs, the Grant T. Fisher Professor and Chair. 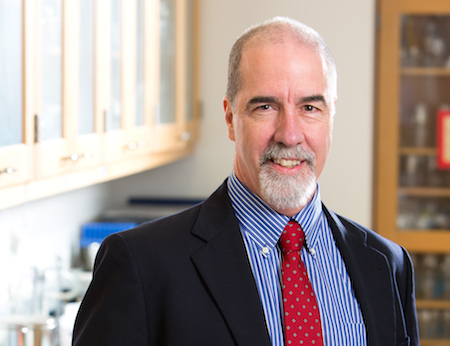 James Bangs is the Grant T. Fisher Professor and Chair of the Department of Microbiology and Immunology in the Jacobs School of Medicine and Biomedical Sciences. The Fisher Chair evolved from a gift made in 1986. An authority on sleeping sickness, Bangs came to UB in 2013 from the University of Wisconsin-Madison Medical School. We play a significant role in bringing renowned faculty to UB, by enabling donors to direct funds to a specific purpose such as an endowed chair. Bangs recently answered some questions about his research at UB; here’s what he had to say. What brought you to UB? Bangs: Having been at my previous institution for 20 years I was ready for a change, and I was ready to take on more of a leadership role in shaping the basic sciences. Becoming a Department Chair was the obvious way to go. A combination of things actually attracted me to UB. First, was the obvious quality of the leadership at the top of the Jacobs School of Medicine and Biomedical Sciences. Second, while the Department of Microbiology & Immunology needed to grow in new directions, the scientific diversity and quality of the faculty already in place provided a firm foundation for that to happen. Third, the vision of where the School was headed was very attractive – it was something that I just wanted to be a part of. What opportunities have kept you here? Bangs: Precisely the things that attracted me here in the first place. Also, my wife and I have fallen in love with Buffalo. It is a truly great city with much to offer anyone with an open mind. 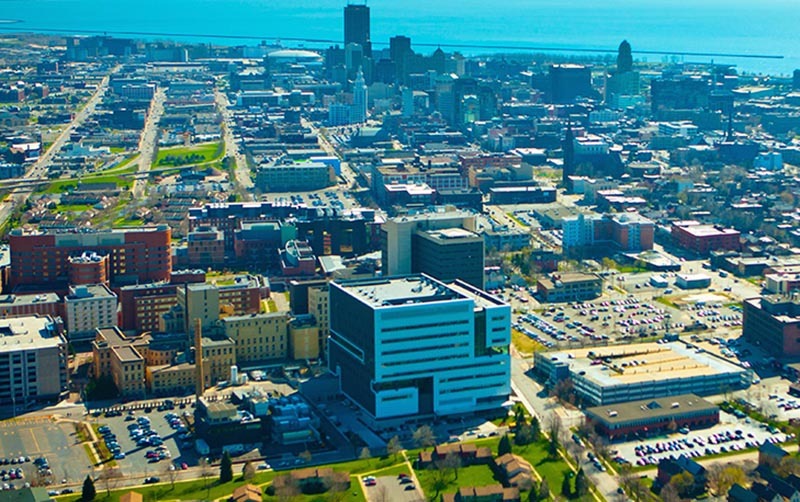 Why is UB a good fit for the teaching and work that you are doing? Bangs: As a basic scientist it is important to me that the culture of the School recognizes and supports my personal research mission, and that of my faculty, as well as our mission to educate and train the next generation of engaged scientists. As the Grant T. Fisher Professor and Chair of Microbiology & Immunology, what impact has philanthropy had on your career? Bangs: Without question the support of the Fisher family has made a big impact on my ability to be a good Chair. I view this as a gift to the department, of which I am the steward. Because the Fisher family had the wisdom to endow the fund in an unrestricted manner I am able to use it with maximal flexibility to support any aspect of our mission. For instance, I can leverage the purchase of big-ticket common equipment items, provide bridge funding for individual faculty research programs, or support local scientific conferences. Bangs: We live in an age of retracting support for public institutions. This is just a fact and it will not go away in the near future. Private support provides us with resources that cannot be had any other way. With vision on the part of the donor, private funds can allow for creative alternatives for furthering our research and teaching missions. What role does private support play compared to other grants and awards you’ve received? Bangs: Again, it comes down to vision and flexibility. Everyone in a basic sciences department like Microbiology & Immunology competes for extramural support via the traditional investigator-initiated funding vehicles, such as American Heart Association and the National Institutes of Health. I am proud to say that my faculty have an outstanding track record in this regard, but these awards are very goal-oriented. Such funds can only be used for the precise purposes stated in the grant. Private support can be used in so many more ways to broadly support the research and teaching roles we play in the broader mission of the Medical School. How does private support ensure the continued success of UB and the Jacobs School of Medicine and Biomedical Sciences? Bangs: No institution of higher education in this day and age can thrive on just the traditional funding streams – State budgets, tuition, and grant overhead. We might survive, but we aspire to be and do so much more. The support of private donors is critical to this distinction! What are the benefits of donors being able to direct their funds for a specific purpose – such as endowing a chair or establishing a center? Bangs: I would say that the benefits follow directly from the vision of the donors. If they perceive a need to play a role in curing a specific disease the benefits will be immediate and obvious. If however, they have a desire to provide support in a broader area, the impact may not be as obvious, but it will be every bit as real. Every member of the Department of Microbiology & Immunology works on some aspect of microbes that cause human disease; by broadly supporting our mission the benefits will follow in many smaller ways that might impact human health globally. I personally am grateful that the Fisher Family has chosen the latter path. Bangs: I am grateful for the honor that they have bestowed on me personally, but I recognize that this is not my award. It is an award to my entire department, and it played a big role in attracting me to UB in the first place. In 1986, a gift from Grant T. Fisher, MD, established a research and development fund that evolved into support for the microbiology and immunology chair. Fisher, a general surgeon, earned his medical degree from UB in 1925. He was a longtime staff member at Our Lady of Victory Hospital in Lackawanna and Mercy Hospital in Buffalo. A fellow of the American College of Surgeons, he was also a member of the James Platt White Society and served as president of the medical school alumni association at UB. Fisher raised eight children with his wife, Evelyn. He died in 1991.